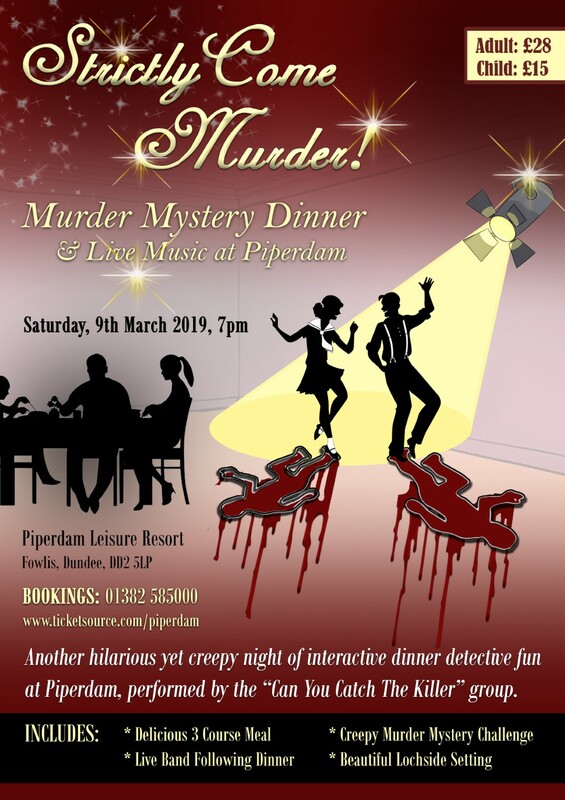 As the latest in Piperdam's highly successful Murder Mystery events, we are delighted to invite you to our 3rd and biggest night yet! With the world of Strictly all the range just now, why not join us for a challenging and gruesome evening where the dancers take a murderous twist right in front of your eyes! Will you catch the murderer, working closely with your fellow team mates, whilst eating the best cuisine in all of Dundee? Will you join in the fun as the terrific Can You Catch The Killer group perform their hilarious antics and giggle humour? Hilarious performances and laughs are guaranteed as Piperdam serves up a delicious 3 course meal in our beautiful Riga Suite and following the dinner is a live band to give you the perfect evening's entertainment! Click www.ticketsource.co.uk/piperdam to book online or call our reception team on 01382 585000 today!